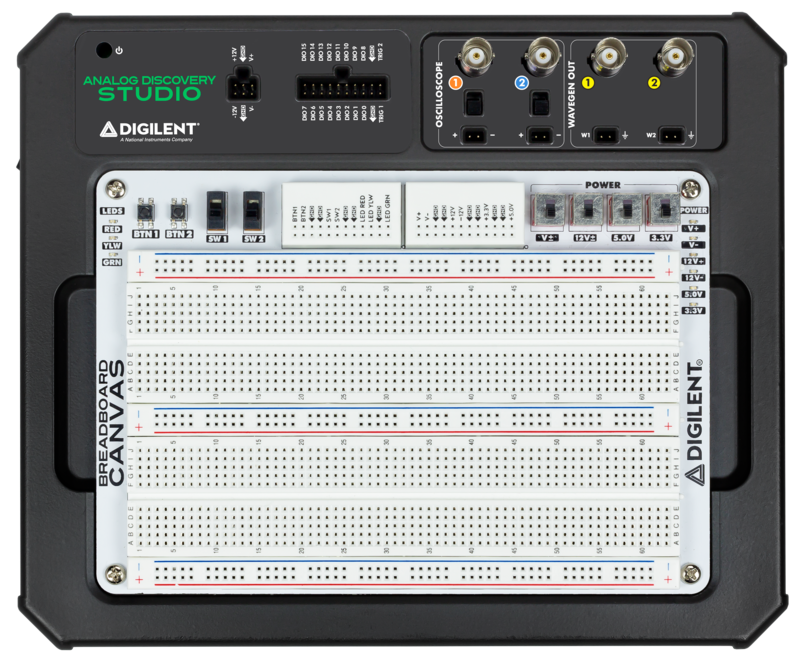 The Analog Discovery Studio is a fully functional, portable test and measurement device that can turn any cross-functional space into a pop-up electronics laboratory. With lab spaces decreasing and student enrollment increasing, many institutions are choosing studio learning as a supplement to traditional laboratories. With an Analog Discovery Studio, students can have a lab experience in the library, a classroom or in a coffee shop. 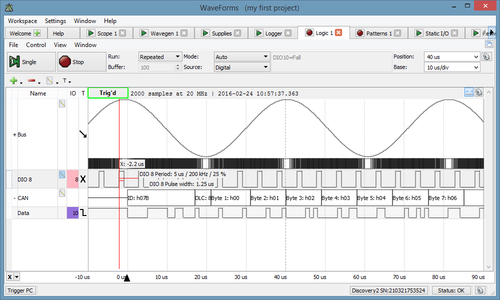 Coupled with the free WaveForms Software, Analog Discovery Studio provides a total of 13 test and measurement tools including an oscilloscope, logic analyzer, spectrum analyzer, waveform generator (function generator) and much more more. Analog Discovery Studio provides an entire stack of bench top equipment with a removable breadboard interface for maximum portability. Enable lab experiments anywhere! Analog Discovery Studio is not yet released. Sign up and we'll send you product info including technical specs and early release notifications! University/School/Institution Name This is required. Department Name Electrical Engineering Computer Engineering Computer Science Materials Science and Engineering Mechanical Engineering Civil Engineering Chemical Engineering Bioengineering Architectural Studies Nuclear Engineering Construction Engineering and Management Other (please specify in comments) This is required. Copyright © Digilent Inc. 2019. All Rights Reserved.